Continuing a five-year tradition, the 9th Grade Percussion class worked up Toboggan after the Fall Concert to perform at the Winter Concert. They only had a week to do this! It’s a good example of how “easier” pieces can be appropriate for more advanced ensembles if the timeframe is short. I was able to catch it from the catwalk in the auditorium. Toboggan is a simply delightful work by John Herndon for beginning or intermediate percussion ensemble that depicts a short, fast ride on a small sled. At least ten players are needed, and the piece uses standard percussion instruments that should be found in every band room. 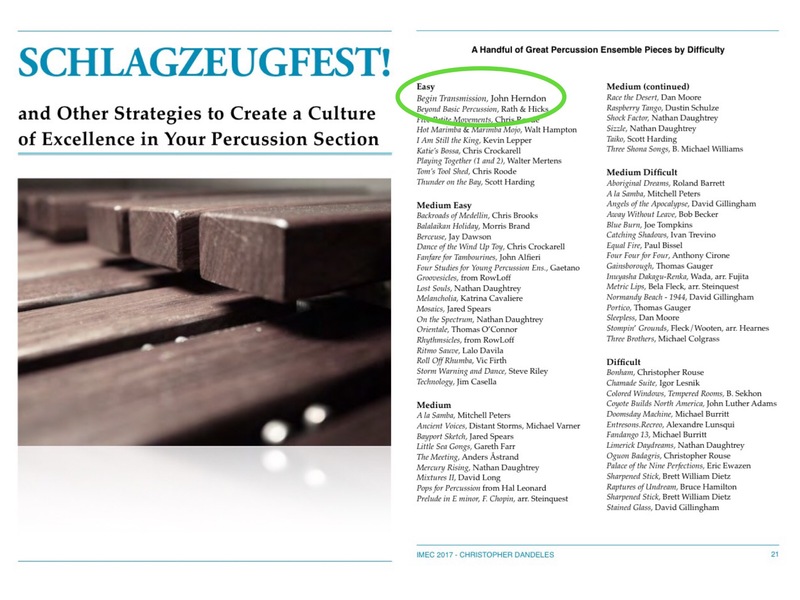 The parts are expertly written to accommodate the varying levels of a middle school percussionist while providing a fun challenging experience for all. It is especially excellent that Toboggan gives players a chance to apply some basic technical skills (scales, natural sticking, reading, and dynamics) that most beginning and intermediate percussionists would be working on already. Toboggan would be a welcome addition to any fall or holiday concert and will help codify important skills for percussionists.